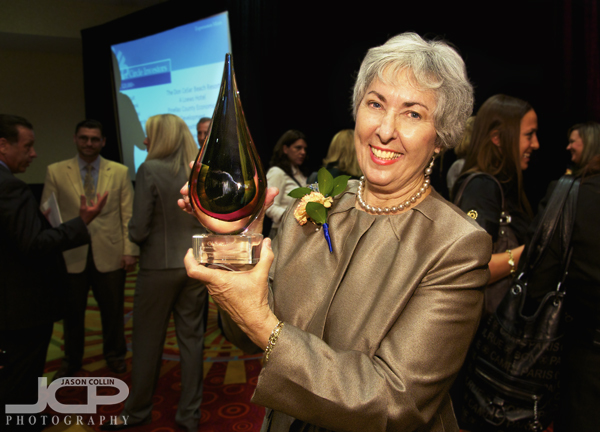 The 2011 Women's Symposium is one of the biggest events of the year for the St. Petersburg Chamber of Commerce. This year the event was held in the strangely named St. Petersburg Marriott Clearwater. There were over 450 people in attendance. That made for a very enthusiastic atmosphere. Sheila Tempelmann (above) won for Community Service Woman of the Year. Naturally, she was all smiles after winning! Bridgette Mill won Business Woman of the Year 2011 - St. Petersburg Marriott ClearwaterUpon hearing her named called for 2011 Business Woman of the Year, Bridgette Mill was overwhelmed with emotion. She apologized for being so emotional, but I found it refreshing and genuine. Also, from a photography perspective, it makes for more powerful images. She runs the Tampa Bay Business Journal. Left to right: Chris Steinocher, Liz Smith, Bridgette Mill, Sheila Tempelmann, Bart Valdez - winners & presentersThe most important shot to get at this event was the one above of both winners and the keynote speaker, Liz Smith. This one appears on the St. Petersburg Chamber of Commerce website, and almost made it into the St. Petersburg Times. It was nice to have the tall red velvet curtains behind the stage to use as a background. Liz Smith of OSI Restaurant Partners giving entertaining keynote speech - St. Petersburg Marriott ClearwaterAfter the winners were announced Liz Smith gave a very well received keynote speech summarizing her own personal business career. Some of what she said was surprising to me. She described how she had no real plan for her career, it kind of just happened. Most of all she just used her instincts to know what was best for her and the when was the right time for her to make a change. What she said about if you are comfortable with your life, it better also be extremely satisfying. That made the most impact on me. I have been in some comfortable situations before, but always ended up blowing them up and trying something else, for better or worse.